Answer: That’s a really interesting question. Let’s start out by defining some parameters. We’ll use a baseball, as I did in my March 10 post. 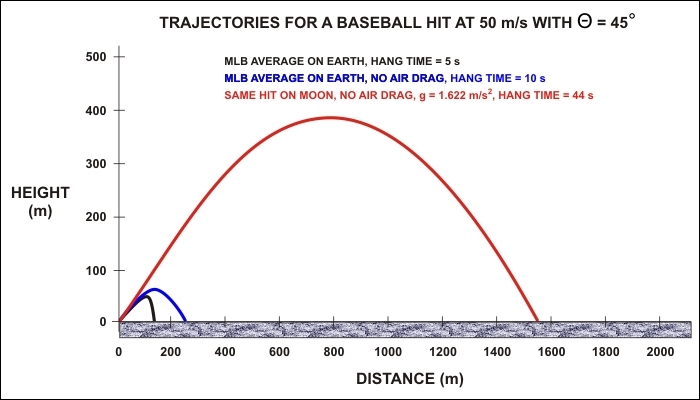 We’ll assume it’s a pop fly, leaving the bat with a speed of 50 m/s (112 mph). That’s a reasonable MLB average home run. We’ll also assume the ball is hit upward at a 45° angle. According to the laws of projectile motion, that angle maximizes its range. The graphic above shows the comparative results. The average pop fly in an MLB game will reach a height of 45 m (150 feet), and go a distance of 125 m (410 feet). Its hang time will be around 5 seconds. The outfielder will sprint to the expected impact point, allowing for factors like wind, altitude, batter stats, and expected hitting strategy. Most pop flies are caught. These guys are good. But they can see the ball. Move the game to the Moon, and everything changes. The graphic shows the difference between a pop fly hit on Earth, a pop fly hit on Earth with zero air drag (hypothetical), and a pop fly hit on the surface of the Moon. On the Moon, you have zero air drag, and only 1/6 the gravity experienced on Earth, so the ball goes a lot farther — outa’ the park by a long shot. The range would be close to 1600 m (slightly less than a mile). Here’s where things get interesting. At it’s maximum height of around 385 m (about 1270 feet), that ball would be nearly impossible to see, so the outfielder could hardly “keep his eye on the ball.” He’d be guessing where it would come down based on whatever part of its trajectory he could follow. And remember … he’s “playing deep” close to a mile from home plate. He could probably see the pitcher and batter from that distance, and he could probably see when the pitch and swing happen, but he’d have a hard time seeing the ball. A professional MLB outfielder can get visual cues from the swing of the bat, and audible cues from the crack of the hit. Unfortunately, there’s no sound on the airless Moon. But let’s cut some slack here and assume the outfielder has a good idea of where that ball is coming down. Now here’s where it gets even more interesting. He’d be “playing deep” expecting something around the 1600 m mark. But with the typical variation in pop fly range, say about ±10%, he needs to be prepared to “sprint” to the anticipated spot. That spot could be 160 m in any direction from where he guesses. Sure, he’s got a hang time of some 44 seconds to get there, and any athlete could easily sprint 160 m in 44 seconds. But you can’t “sprint” on the Moon. Turns out that lower gravity also makes “sprinting” impossible. Running at any speed requires a coordination between gravity and leg motion. Imagine you’ve got enough helium balloons tethered to your body to make your weight only 1/6 normal. Now imagine trying to run under those conditions. Your feet would not return to the ground quickly enough to sustain a high speed. Human physiology evolved in normal Earth gravity. When astronauts moved around on the Moon, they found that a type of “skipping” motion was the most efficient way to get from point A to point B. Take a look at the video clip below and you’ll see what I mean. By the way, that’s Apollo 17 astronaut Eugene Cernan, the last man to “walk” on the Moon back in 1972. Video courtesy of NASA. Running the bases, throwing the ball (spin is useless in a vacuum), the behavior of grounders, and the ability to jump 6 times higher to snag a ball on its way over the fence, would all be game-changing adjustments. So even if they built a lunar ball park under a sufficiently large dome, where you could have grass, air, and get rid of that cumbersome space suit, baseball would be a very different game on the Moon. My prediction is that, once the Moon is permanently colonized, sports will morph to take advantage of its unique environment.